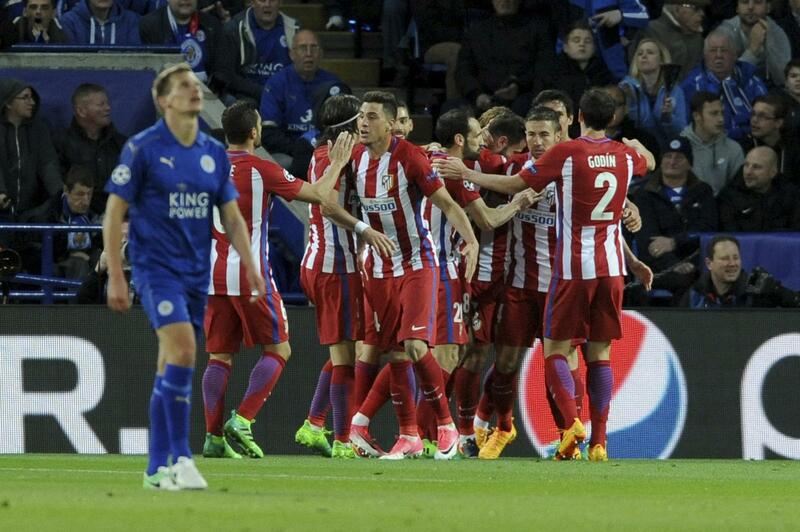 LEICESTER, England – Atletico Madrid reached the Champions League semifinals for the third time in four seasons by ending Leicester’s fairytale European journey on Tuesday, drawing 1-1 at the King Power Stadium to advance 2-1 on aggregate. Once Atletico grabbed an away goal through Saul Niguez’s first-half header, any hopes of the English champions extending their debut in Europe’s elite competition seemed to be completely extinguished. Especially since Atletico was looking technically superior, attacking with greater skill and potency and outplaying the European novices. And yet the spirit that powered Leicester to a remarkable Premier League title triumph returned in the second half as a tactical switch to by caretaker manager Craig Shakespeare from 4-4-2 to 3-5-2 put Leicester firmly back in the game. The subdued atmosphere was lifted by Jamie Vardy’s 61st-minute strike, but leveling the score on a chilly central England night wasn’t sufficient. A defense as sturdy as Atletico’s wasn’t going to allow Leicester to score the two goals it still required to go through as a succession of shots were intercepted. The tactic certainly made life difficult for Atletico. England’s last Champions League representatives went out with a fight exactly eight years to the day since Leicester began its dazzling ascent by clinching the third-tier title, with the exhausted players collapsing the turf at the final whistle after pressing with grit and directness. Leicester, which is 12th in the Premier League and not sure of survival, now faces up to the reality that it could be many years before the team can contemplate a return to the Champions League. Atletico will focus on trying to land the prize the keeps eluding Simeone. It was a finalist in both 2014 and 2016 but beaten by Real Madrid on both occasion, while a constant contender for the Spanish title. Real could thwart Simeone’s ambitions again. Atletico’s neighbor also reached to the semifinals on Tuesday, with Cristiano Ronaldo scoring a hat trick in a 4-2 victory over Bayern Munich after extra time that clinched a 6-3 aggregate win. The semifinal lineup will be completed on Wednesday when Barcelona hosts Juventus and Monaco faces Borussia Dortmund. For Leicester, Tuesday felt like a closing of a chapter, and the buildup to the quarterfinal felt like that with the theatrics. The seats were covered in foil flags in blue, silver and gold for fans to hoist, while canons of dry ice were set off steam from the stadium roof. Leicester, though, was blown away from kickoff by the sharper, vastly more experienced visitors, featuring nine starters from last year’s final loss. Antione Griezmann, whose controversial first-leg penalty had given Atletico the edge, was a constant menace. Not only gliding past defenders but also when tracking back on defensive duties of his own – disrupting the advance of Riyad Mahrez in one early intervention. Leicester was finding pockets of space to attack but it allowed Niguez to score far too easily in the 26th minute, with the midfielder left unmarked to meet Filipe Luis’s cross. Vardy was the closest Leicester player to Niguez as the header beat Kasper Schmeichel. Ulloa came on at halftime with Ben Chilwell, whose impact was more immediate. Two efforts went over the crossbar, first from a dipping volley and then a header, before the left wingback created the equalizer. A shot was intercepted by central defender Stefan Savic and the loose ball fell for Vardy to power into the net. It was the seventh goal for the revitalized Vardy in the 10 games under Shakespeare. It lifted the subdued atmosphere, belief returned to the stadium that was scene of such unexpected euphoria. But the home fans couldn’t will the ball into the net as Ulloa had a shot blocked on the line, Vardy struck straight at Savic and Mahrez angled a strike over the top. Published: April 18, 2017, 1:41 p.m.